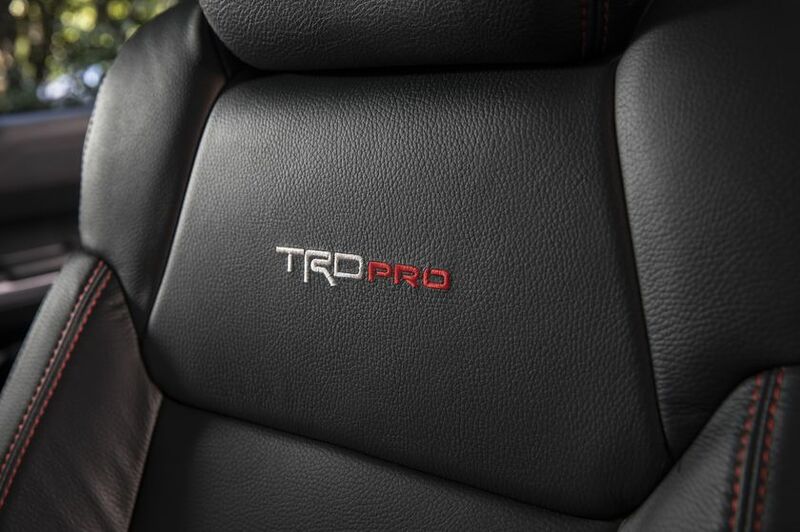 Since its unveiling in 2015, the Toyota Tundra TRD Pro is a vehicle that opens up a whole new world to its owner. This stylish truck is adrenaline-fueled with power to spare and ready to go off the pavement. Available in three trim styles – regular cab, extended double cab, CrewMax crew cab – there are also two available wheelbases and three bed lengths – 5.5-foot short bed, 6.5-foot standard, 8.1-foot long bed. With a MSRP of $57,520 the 2017 Tundra TDR Pro comes loaded with exclusive performance and capability equipment which allows it to tackle anything the roads, or lack thereof, can throw at it. Come see the 2017 Tundra TRD Pro at Sherwood Toyota today for everything it has to offer. The 2017 Toyota TRD Pro is a force to be reckoned with when it comes to power. A 5.7-litre V8 generates 381 horsepower and 401 ft.-lb. of torque. 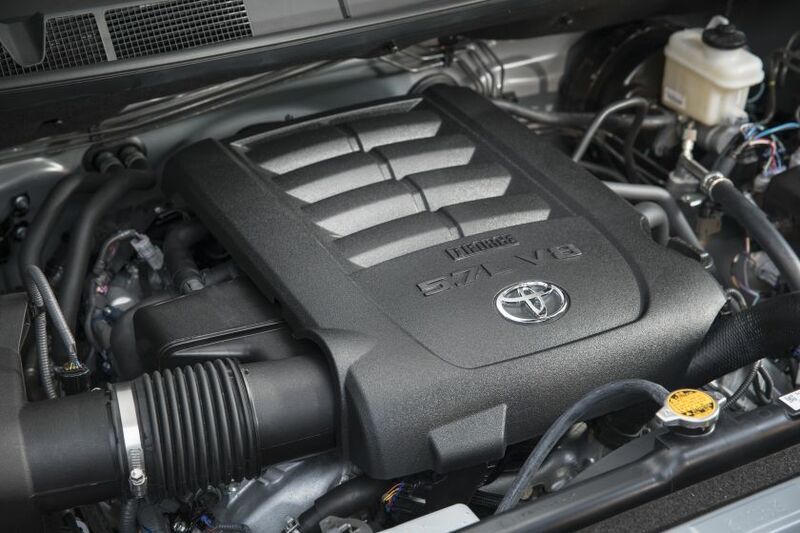 This engine is coupled with a six-speed automatic gearbox, and the TRD Pro package also includes TRD-tuned springs that are matched to oversized 2.5 inch remote-reservoir Bilstein® shocks that provide a 2-inch lift. In the rear, the massive Bilstein® shocks are matched to the TRD off-road leaf spring. The truck also includes clearance and backup sensors, limited-slip differentials, and fuel tank protector plates. 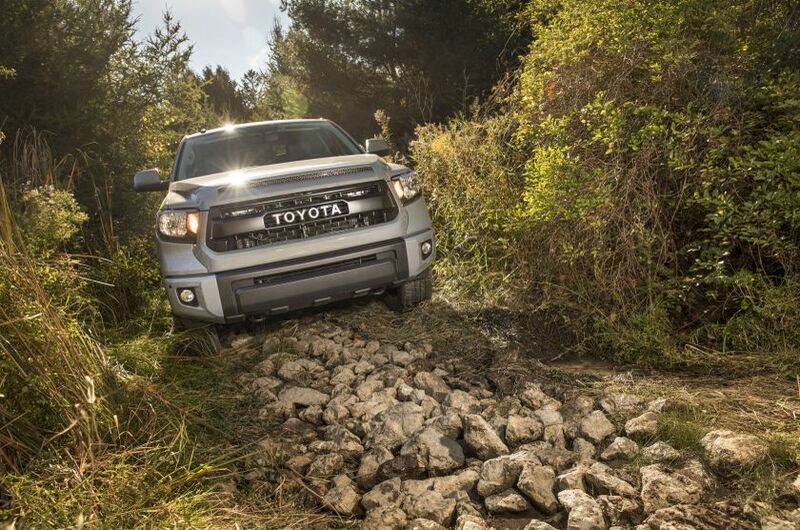 The Tundra TRD Pro can outhaul and outrun the competition with a towing capacity of up to 9,700 lbs. The 2017 Toyota Tundra TRD Pro comes loaded with a host of safety features to make its occupants feel safe. Front fog and high performance driving lights come standard to make sure you can see anything and everything. The truck has four-wheel anti-lock brakes, with stability and traction control to keep the wheels on the ground and avoid potential rollovers. Inside there are front side-impact airbags, side curtain airbags, and knee air-bags. Also standard is a rear-view camera which automatically activates when backing up so the driver has a view of everything behind it. Optional safety technologies like blind-spot monitoring, rear-cross traffic alert, and parking sensors are also available. The 2017 Toyota Tundra TRD Pro is not only extremely capable, but equally easy on the eyes. 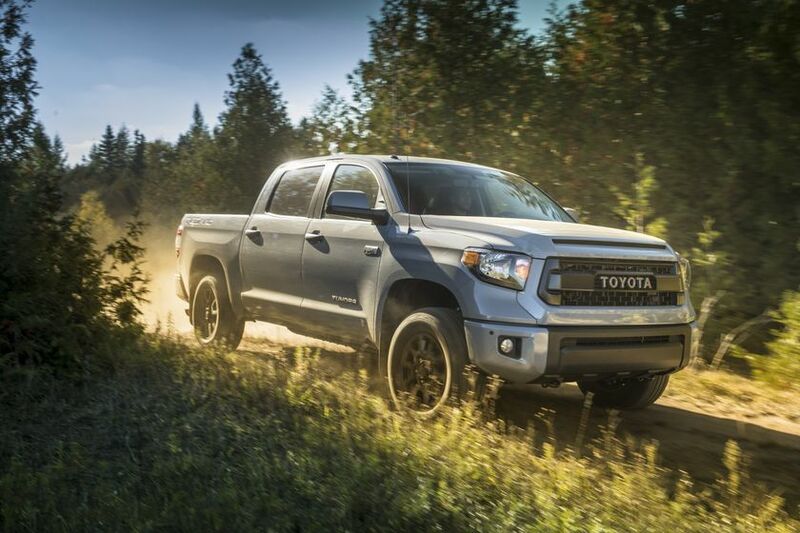 It’s aggressive design, large chrome grill, black-bezel headlights, and TRD Pro emblems spread throughout the vehicle’s exterior and interior lets everyone know this is no ordinary truck. The 2017 Toyota Tundra TRD Pro has a high stance with standard 18-inch black alloy rims with 32-inch Michelin® LTX AT2 tires. Inside, the black leather trimmed front bucket seats and leather trimmed steering wheel with integrated audio controls and cruise control makes everything look stylish and feel luxurious. The dash is designed to be user friendly with simple and sturdy controls. Privacy windows all-around keep occupants and cargo out of the glare of onlookers, while adding another touch of style to the overall package. 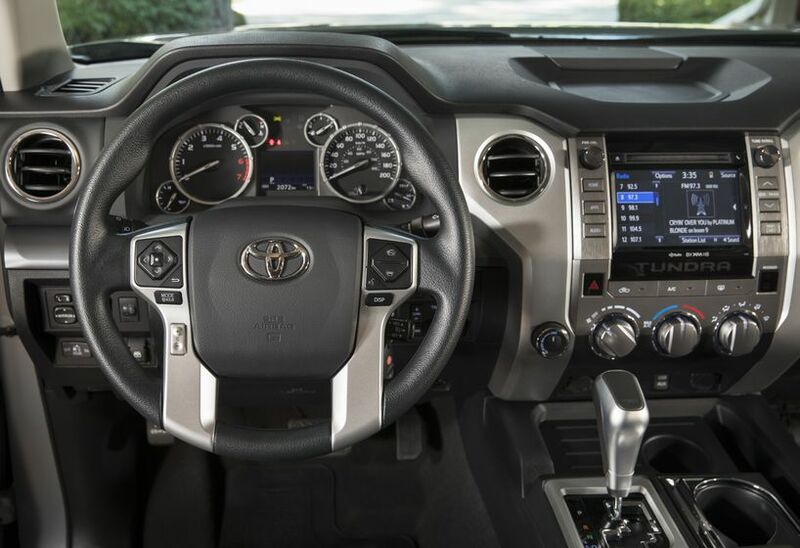 The 2017 Toyota Tundra TRD Pro is loaded with a host of technological features that make it a class leader. Standard features such as a rear-view camera and Toyota Entune® with a 7.0-inch touchscreen interface with smartphone connectivity. This system allows the user to fully integrate their smartphone with the vehicle for music, navigation, and hands-free calling. There is a premium audio system which includes satellite radio and GPS navigation. The interior includes standard one-touch power windows, remote keyless power door locks, and heated mirrors. With this variety of options it’s easy to make the 2017 Tundra TRD Pro a vehicle that’s been customized for you and your needs. If you need a truck that can go off the road as easily as it can stay on it, then look no further than the 2017 Toyota Tundra TRD Pro. With its stylish look and incredible power this truck can do it all. Thanks to the latest technology and safety features you can do it all too, with the confidence and peace of mind that comes with driving a Toyota. Come see the 2017 Toyota TRD Pro at Sherwood Toyota today for a test drive and check out everything it has to offer. We are located at 31 Automall Rd, Sherwood Park, Alberta or call our expert Sales Staff at (780) 410-2455 for any questions.